Over a good many years we have created, though I say it myself, quite an important snuff bottle collection. My wife, thank goodness, shares my interest in these little bottles, but perhaps I should warn you, collecting anything is a bit like a bug, once caught, it is with you for ever and can be quite an obsession! Have you ever searched for pebbles or shells along the sea shore, selecting them for either colour or shape and found an appeal in handling them, so much so, that you simply could not throw them away? If so, you have the makings of a dedicated collector. Part of the pleasure of owning these bottles is the tactile appeal found in handling them. There is also such a vast and diverse number of collecting possibilities. A collection could be based on any of the great Chinese fine arts and in each field it would be possible to have really important fine examples in this form of miniature works of art. There are collections based on jade and hard stone carvings, others prefer glass and 'overlay glass', or Chinese porcelain, or enamels and cloisonné, or you might even like to base a collection on paintings. I can imagine how you find it hard to perceive a collection of bottles based on Chinese paintings but they exist. Remarkable signed landscape scenes and even portraits with superb calligraphy (often poems) have actually been painted on the inside of glass and stone bottles. Some collections feature uncarved bottles of rare stones, or lacquer, or amber and ivory. Most collections consist of the collector's favourite subject but include a variety of other treasured bottles. There are collections that use as a theme; animals, or a colour such as 'Imperial yellow', or blue and white, and as there are so many possibilities, no two collections ever look the same. For anyone considering buying snuff bottles I should explain that it is an international pursuit. There is even an 'International Chinese Snuff Bottle Society' with a large and active membership. Having been members over a long period we have found that fellow members are such interesting and friendly people. There is a bond between a collector that leads to friendship, until we meet in the auction rooms that is! It is well worth joining, as there is a very informative, quarterly magazine, full of good colour photographs. Information is surprisingly, freely shared amongst members and by the specialist dealers. So much can be learned this way, in fact far more than just by studying the many very fine, beautiful books on the subject. Most people's first encounter with these bottles is likely to be at antique shops, auctions or antique fairs, otherwise in a museum or perhaps by meeting a collector. Once seen, certain people are tempted when next coming across a bottle to buy, but all too often these first purchases are of very poor quality. Later on, having acquired more knowledge, these first bottles so often prove to be disappointing. They often can turn out to be very costly mistakes. Unfortunately, there are far too many very poor bottles about, some are even brand new, made to cash in from the collecting craze. Even an article like this one can cause someone to go and buy without sufficient knowledge, I do hope not. My advice is that apart from joining the society, attend some snuff bottles auctions and visit some of the specialist dealers. When you go to the auction rooms be sure to go on the viewing days, usually one or two days before the sale. The first impression will probably be one of disappointment as there will be lots of poor quality bottles and to see so many all lying down, behind glass, is not the best way of presenting them. Be sure to select a few that appeal to you and ask to inspect them. You will then be given a chance to handle some, and that is when the magic can begin. I do not know how to explain what happens, but there is something of a tactile pleasure that is only obtained from handling a good piece. I should point out that our bottle did not immediately grab my attention. Surrounded by many beautiful and more colourful bottles of all shapes and sizes in a dealers display cabinet, this brown and beige coloured bottle looked rather drab. Eventually, I came round to inspect it and before too long I knew that we had to buy it. Only another collector can fully appreciate that overpowering urge that comes over one as it is the closest feeling to that of love at first sight. I have been told that ones pupils tend to enlarge, and this is one of the signs that dealers watch out for, and as collectors, of course, we always try desperately to camouflage our interest. This bottle was purchased, which is still a favourite, and it has formed the basis of our collection. Our collection included many types of Chinese snuff bottles but features mostly hard stones, known as 'Picture Agates', each one of these being a unique piece, as there can never be two alike. To fully appreciate these bottles I need to tell you more about how a stone bottle was made. All good early snuff bottles were made to be used and they needed to be small yet capable of holding plenty of snuff, not too heavy as they were carried on their person, often in the sleeve. All these antique bottles were designed to feel comfortable in the hand and were sealed with a cork, to keep the snuff at its best. In Europe hinged boxes were used but perhaps the humidity in China caused them to prefer bottles with corks. All snuff bottles have a stopper on to which a cork is fixed, and at the other end of the cork is an ivory spoon. These stoppers rarely matched the bottles other than in size and shape. It was a matter of personal choice as to what type and colour was considered best to go with the bottle. Stone bottles were carved in a large variety of shapes but always with a fairly small opening in the neck normally about 5mm in diameter. Just imagine a lump of quartz rock that is quite impossible to scratch even with your stainless steel penknife, yet in the 18th century this was carved into a bulbous shaped bottle. Next it was drilled through the neck and hollowed out through this small hole, so that even difficult areas such as the shoulders of the bottle are really thin. Fine bottles are so well hollowed that they look more like blown glass, and are aptly described as 'Eggshell thin'. Should you place them in a bowl of water they will trap enough air to float. Although I have mentioned that drilling was used, the information available about the manufacturing methods is incredible, as the drill and cutting discs were foot operated 'Heath Robinson' affairs. However I do believe after many years' experience, they acquired more control and feel than is possible with modern electronic equipment (essential in working on jade as certain parts of the stone can easily fracture whilst other areas are very hard). Most of the carving was achieved by grinding with jade, gem stone, sand and other abrasive particles. First by drilling and then hollowing out by carefully grinding away with special file-like tools. These tools were made by hammering soft metal shapes over the abrasive particles that once embedded, were easily bent to reach the most awkward parts. The Chinese appreciated these wonderful stone bottles and they were fashioned from many types of stone, the purity of the material, particularly the jade ones being highly prized. The chalcedony or quartz bottles once 'Eggshell thin' show up remarkable markings formed from the formation of the crystals. Everyone I am sure can appreciate such bottles, as the lovely shapes and purity of the stone just cannot fail to impress. What I find even more fascinating is the amazing way they deliberately, brilliantly take advantage of flaws and inclusions often present in the stones. Most quartz and jade stones have an outer layer of a different colour, particularly the pebbles from the riverbeds. They also have faults and flaws plus other coloured material, often deep in the stone. Sometimes these can be very thin skin-like inclusions, in others large blobs are found. The problem is no one knows just what is in the rock until, as the cuts are made, the secrets of the stone are revealed. It is with this type of material that 'Picture Agates' are made. The best of these incredible bottles look as if the inclusion, that forms the image, has appeared in just the right place as if to order! There are different types of work within this group of bottles and the first ones are what we call 'Cameo' carvings. These take advantage of an outer skin or a blob type of inclusion; they can be quite thick and are carved in relief. Another type is called 'Shadow Agates' and these take advantage of markings in the bottle where, with the help of a little carving, an image is created. Lastly, the most fascinating ones are called 'Silhouette Agates' but in this group no apparent carving is required. The image is achieved mainly by the angle and choice of shape, as well as the size and position of the bottle to be formed out of the rock. These bottles have to be seen to be believed. 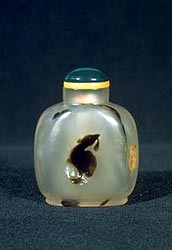 What is really mind blowing to me is the fact that some of these chalcedony and jade Chinese snuff bottles have used the natural flaws to form pictures on both sides! Sadly, few of them were signed. We only know that there was a certain school of carvers known as the 'Suzhou School'. Their works are easily recognised by the style and quality of the carving, plus the fact that they make use of every mark in the stone to form the picture. They are amazing bottles when good, but there are later works that tend to look too stiff and the carving lacks the more fluid artistic touch of the master carvers. Unfortunately, hardly any of these bottles are really well hollowed. So to describe my first purchase, this was a 'Shadow Agate picture bottle' involving a little carving, and very well hollowed. 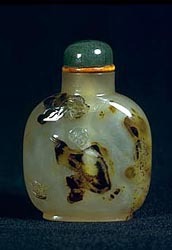 It is a most appropriate subject and colour for a Snuff Bottle because the russet inclusions have been used to show 'Putai Ho-Shang'. He is always depicted as a very corpulent man with a bare chest and abdomen and he is the patron saint of tobacconists. 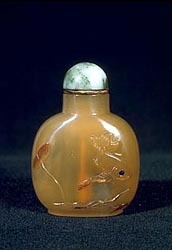 In this bottle he appears surprised by a bat whilst sitting below some tobacco leaves. The bat to the Chinese is a good luck symbol. You can see how easily he appears, nicely placed within the bottle yet only his head and a suggestion of his hand have been carved. We now own a number of 'Picture Agates' and to illustrate the different types described, the photograph of the duck with lingzhi fungus in its beak is a good 'Silhouette' example. Incidentally, the fungus is a symbol for wishing long life. This snuff bottle is very unusual as there is a recess carved originally to create the image that serves as a built in dish. 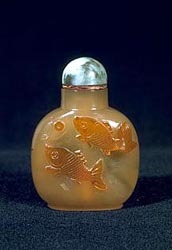 Lastly, a superb Chinese snuff bottle of fishes with pictures on both sides: the pair of fishes are cameo carved and to the Chinese represent fidelity and happy conjugal rights in marriage. On the other side a fish and aquatic plants make use of every mark in the stone, all this on a well shaped bottle that is very well hollowed. All these bottles illustrated were made between 1750 and 1860. To effectively judge hard stone carvings, the first consideration should be concerned with the overall artistic impression. You need to be satisfied that the work looks well composed and well positioned and that the images formed are flowing rather than stiff and awkward. The next stage is to have a closer look at the technical skills. When I look at a cameo type of carving I study the shape and finish of the background, close to the edge of the carving. On poorer bottles this can be indented, uneven and not so well polished as the rest. Really fine examples look as if the raised cameo part has simply been glued onto a beautifully formed bottle. Engraved work at its best is very precise and provides the detail. When closely looking at a poor bottle the engraved parts can look very crude. Beware, amazing glass imitation stone bottles exist. To check for these use a magnifying glass and look for tiny bubbles or pin size holes on the surface. As a last resort if still in doubt, a penknife will easily scratch the base if it is glass, whereas a stone will not be marked. In evaluating the value of all artwork a careful check for any damage is essential. With stone bottles the following points should help. Firstly, assess how well the bottle has been hollowed by holding it up to the light. Inspect the stone from all angles in the light and with light from behind. If the stone is cracked it will be visible often as a star shape from the point of impact. Some stones have natural flaws that are not cracks. I then have a good look at the foot rim and the neck of the bottle, as these areas are the most susceptible to damage. If none is apparent I consider the proportions to make sure neither has been ground down to remove a chip. When inspecting the neck as viewed looking down into the bottle the top surface should be concave, not flat. Bottles that have had the neck repaired to remove any damage are always flat, and you can be sure no longer original. There is one other criterion that I personally believe is important. Most of the best stone bottles were made between 1750 and 1860, although many poor bottles have been made since then, right up to the present day. These late bottles were not really made for use, and some are referred to as 'cabinet pieces' and can fairly easily be identified. They are poorly hollowed, if at all. Some just have a drilled hole in them and so they feel far too heavy. They also tend to be very showy in choice of materials, with impractical rather high and sharp carving that feels most uncomfortable in the hand. There are others so delicately carved that one instinctively knows that they could not survive actual use. It is only possible to make these judgments by comparison. Experience is needed and takes time to acquire. There are advantages in collecting very small items as they are not too obtrusive and can easily be locked away. This is very important if your partner does not share your interest! They can also make a beautiful display without completely disrupting your home. Try to be certain that you really are enthusiastic about collecting before you buy one. Once you place one in your home and it looks so small and appealing, it is only a matter of time before you will come to the conclusion that a little group of bottles will look so much better. This tends to play on one's mind and that is how we all get hooked! Collecting, magical, stone, snuff bottles, John Neville Cohen, Picture Agates, Eggshell thin, flaws, inclusions, Chalcedony, Quartz, bottles, Cameo, Shadow Agates, Silhouette Agates, Suzhou School, Jade, Putai Ho-Shang, bat, Lingzhi fungus.